Now selling the final phase. Let’s build a HardRock Home on it. Get in touch and let’s get started. Our custom homes are spread throughout the Salt Lake Valley. Most of our customers have a dream home in mind, so as a luxury homebuilder in Utah, we’ll happily customize a model home to suit your needs, your lifestyle, and your budget. Or we’ll design something just for you. Decide on the number of rooms, room sizes, and ceiling heights—everything is flexible when working with the best homebuilder in Salt Lake City. Hundreds and hundreds of happy clients in Utah have built their homes with us. Be part of our list of loyal customers (now homeowners) and let us make your dreams become a reality. 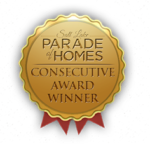 With our commitment to quality & service, we’re proud to say we’re an eight-time Utah Builder Parade of Homes winner. We have won in all five categories: Best Architecture, Best Interior Design, Best Landscaping, Best in Category, Blue Ribbon for Interior Design. Hard Rock Homes is the trusted custom homebuilder in Utah. We’ve been building beautiful custom homes since 2003— that’s over 15 years of listening carefully to clients, paying attention to details, and over 15 years of continual innovation and reinvention. We are constantly asking the question: How can we be better? From the initial meeting to handing over the keys, we strive to deliver excellent customer service, because that’s exactly what separates us from the rest of the other top homebuilders in Utah. Each member of our team is dedicated to making sure the experience is wonderful for our new homeowners. Pearl Cove is in the final phase.